The ruthless Rocks put eight past Whitehawk – and were promptly told to maintain their high standards to avoid an FA Cup shock on Saturday. Manager Jack Pearce and coach Robbie Blake were delighted by the clinical way their young side put the Hawks to the sword in Tuesday night’s senasational 8-0 drubbing, which saw Jimmy Muitt net four in a spell of six Rocks goals in 15 minutes. Now they are drumming into their squad they must treat Cup second qualifying round visitors AFC Sudbury – who play a division below them in the Bostik League –in the same way at the weekend. The Velocity Trophy thumping of Whitehawk stretched their unbeaten start to 2018-19 to nine games and left fans jubilant. There’s £9,000 up for grabs from this week’s FA Cup tie and a place in the third qualifying round, which is two games away from the first round proper. Boss Pearce said Tuesday night’s goal glut did not surprise him. “After the first half hour we could easily have been three or four up and that brings people out,” he said. “For the first 28 minutes of the first half, for an XI that had never played together before, and taking into account some of their ages, I thought some of the football was excellent. “But we then made the same mistake as we did at Carshalton, where we played as good a game as we’ve played for a long time. When you don’t score, players think they have to do something else. They try to do more difficult things. “For the 15 minutes before half-time we were appalling and nearly every chance Whitehawk had was through us not doing what had been asked. We had a good chat about it at half-time and I said it was most important we got back on song. Pearce said he was not worried the squad would get complacent about their ability. “Team spirit is excellent but the important thing now is to keep their feet on the deck and understanding why we did so well,” he said. “We’re trying to instill into them how important it is not to concede. There were a couple of occasions on Tuesday night when we were 6-0 up and they broke, but all 11 of our players were getting involved in defending, getting goal side. Apart from Muitt’s four goals, there were two for Tommy Scutt and sublime finishes from Doug Tuck and Whyte. Pearce added: “I was pleased for Tommy Scutt getting two goals and some of our goals were excellent. That can only give us confidence and what we need to do now is build on that because we’re capable of quite something. “The problem I have at the moment is trying to build a squad. Bringing people in is difficult because they will want to know, are they going to get a game? And they can get very frustrated. “We’ve lost Harvey Sparks because of it, but we’ve got Joe Tomlinson in at left-back and he’s only 17. He’s a very good kid. “Now we need to train hard on Thursday, keep their feet on the deck and prove to them that if they move and pass the ball, they could be successful. “There was no Dan Lincoln, no Dan Smith and no Keaton Wood and I can assure you they will all be starting on Saturday. So we’ll see where we go. It’s important we train hard and hopefully we won’t pick up any new injuries. Pearce admitted the Velocity Trophy (league cup) was not the top priority but added: “Winning becomes a very good habit.You have to try to win everything you enter and as long as you’re not reckless, that’s okay. But you will get the odd injury. 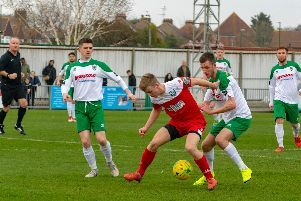 Pearce knows it is a long time since Bognor’s FA Cup glory days of the 80s and 90s and does not want to see this year’s run end yet. “The FA Cup is the competition it is is because of teams from a lower level beating teams from a higher level and you have to make sure you are not one of them. And the only way you can do that is if you’re prepared mentally and work hard as a team. Blake was equally enthused by the win over Whitehawk and said: “A lot of things impressed me. We played with an intensity they couldn’t cope with. Our build-up play pleased me and we have the quality in the final third to hurt teams. “The most important thing was our attitude - it was first-class. You respect your opponents, you do the right things and once you do the right things once a team is dead and buried you go on and win 8-0. Looking ahead to Sudbury’s visit, Blake said: “We have to keep our feet on the ground and apply ourselves on Saturday and if we do that we’ll be looking for a positive result. Reflecting on the Whitehawk goal feast Blake said: “They were all very well-taken goals - they’d grace any level. But we have to keep our fett on the ground and take that second-half performance with us. “We can play with a tempo that in our league, teams can’t handle. “Once you treat a game and opponents with respect you get your rewards. “I’ve got no problem with the lads thinking they have made it. We will be bang on for Saturday. “We had three key players missing but the lads who have come in have done themselves no harm.